WHAT TESTING HAS BEEN DONE ON THE DIRECT OIL FEED (DOF)® SINCE IT’S INCEPTION? Over three years of testing and development went into the Direct Oil Feed (DOF)® system. Several vehicles were picked during the development stages with prototypes being installed and documented. The first finalized, non-prototype DOF® was presented in February at the 2013 PCA 48 Hours at Sebring, after three years of prototype development and testing. We placed the first finalized DOF® on our #93 Spec Boxster for the 48 hour event and documented the results (specifically oil pressure drops and other parameters) afterwards. The oil fed to the ball bearings has also been cooled, dropping temperature significantly on the bearing of an average of 30+ degrees F.
The DOF® was not an overnight idea put straight into production either, there had been several design concepts and changes throughout development process. It is the result of studying many engines that have failed as well as more that did not fail (only were opened to be resealed). Most IMS bearing replacements that we performed were for customer “peace-of-mind.” We found that only a very small percentage of IMS bearing replacements and or engine rebuilds had IMS bearing related problems, with majority of the IMS bearings showing to be non-problematic. Ball bearings have been and are still in use in Motorsports and racing engines to this day. Out of more than 90% of the engines we have taken apart to rebuild, the IMS bearing has not shown any issue and minimal wear even after 200,000 plus miles. Again, the intermediate shaft bearing is not the issue. It’s the lack of lubrication & cooling to the IMS bearing that is the issue. The ball bearing was a modern development which reduces friction and requires less lubrication (than a flat design) and is used on just about every race car and race engine, but STILL requires LUBRICATION. Basically, if the DOF® system malfunctions, the IMS bearing will still operate and act as originally designed, whereas other bearings such as flat bearings require lubrication constantly because it must run on a film of oil. Oil feed systems to ball bearings found on rotating assemblies, machinery equipment, turbo chargers and turbine engines have been in use for years even before Porsche’s M96 / M97 engine platform. It is not a new concept to provide proper lubrication, cooling and particle contamination removal to a ball bearing that requires it, so the same concept has been applied to the IMS bearing found on the M96 & M97 engines. Ball bearings have been and are still in use in Motorsports and racing engines to this day. WILL THE (DOF)® KIT WORK FOR NEWER ENGINES THAT HAVE THE LARGER IMS BEARING? Answer: Yes. Since the IMS bearing on the newer style engines is much larger and cannot be replaced unless you dismantle the engine, the DOF® provides the perfect solution for these later engines. Simply follow the same step by step procedure and remove the outer seal of the IMS bearing and re-assemble with the DOF® kit. This will ensure oil flow to the bearing to properly lubricate and cool it. How much oil is fed to the IMS bearing per minute? At 4,500 RPM (with engine at normal operating temperature), 0.18L (180cc) per minute of oil is transferred to the IMS bearing. Using the DOF, 3cc’s of oil per second are being directed to the IMS bearing, which is nothing compared to the total flow of oil the oil pump and the oil pressure is compensated by the pressure regulator with no problems. IS THERE ANY LOSS OF OIL PRESSURE AFTER INSTALLING THE DOF®? Answer: No. There is a drop of less than 0.5psi pressure loss. If there is a discernible drop in pressure for whatever reason, the engine also has a pressure compensation system to regulate that pressure. The pressure variations in the crank are higher than that during normal operation. The car operates at 60-80 psi of oil pressure under driving conditions. It’s over 100 psi on cold start up. WHY KEEP A BALL BEARING IN THE ENGINE TO SUPPORT THE IMS SHAFT? DOESN’T THE OTHER END OF THE IMS SHAFT USE A FLAT BEARING? We stick with the ball bearing because the bearing is not the problem. We don’t want to redesign the engine, just provide the proper lubrication & cooling to the IMS bearing. The other end of the intermediate shaft does have a flat bearing, but don’t forget to factor in that that flat bearing is under constant lubrication by the oil pump. WHY IS THE DOF® HOSE ONLY RATED AT 3,000 lbs.? WHY NOT USE A HOSE WITH A GREATER PRESSURE RATING? We spec’d this hose out with the manufacturer for the intended use and the recommendation was to go with a DOT approved, 3,000 psi rated hose even though the oil pressure will never go over 150psi. Chances of blowing a 3,000 psi rated hose in this application is zero. IS THE OIL THAT GETS TO THE DOF® FILTERED OR UNFILTERED? To the right is a Porsche diagram that we filled in the oil path to the DOF. 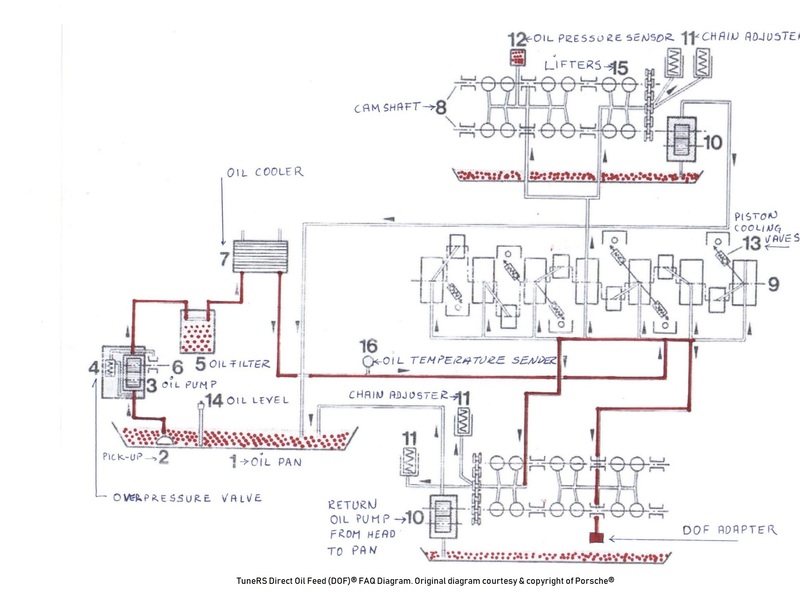 Based on this diagram, oil is picked up from the pan (#1) through the oil pick up (#2) is passed to the oil pump (#3) which is pressure regulated (#4) and filtered (#5) before being passed to the oil cooler (#6). As you can see there is no oil being bypassed and all is filtered and cooled before getting to the DOF. WILL THE OIL USED BY THE DOF HAVE ANY DEBRIS FROM PASSING OVER THE LIFTERS AND CAM FOLLOWERS & DOE THE OIL USED HAVE EFFECTS ON THE TIMING? Go back to the Porsche diagram. When oil is pumped through the oil cooler (#7), it goes into the crankshaft housing. On cylinders 4-6, there is a double oil feed that is supplying oil to that side of the motor through the oil galleries. Oil that is used for the lifters or to lubricate the cams is pumped out by the return oil pump (scavenge pump) from the head (#10) and back into the pan to be filtered, so it never gets into the DOF. Oil that is being used by the DOF® is not the residual oil of the head, that oil gets pumped back into the pan, the oil going to the DOF® is a direct feed from the gallery. Pressures are compensated by the oil pressure regulator. Nothing is being passed through any wear parts. Oil is coming directly from the filter, through the cooler, directly to the galleries. All of the oil that is always used on any component (crankshaft, rods, piston cooling valves, camshafts, lifters) that residual oil goes into the specific pans and is pumped back into the main oil pan to be recycled through again. ISN’T THE OIL COOLER IN THE STOCK BOXSTER MORE OF A HEAT EXCHANGER USED TO GET THE OIL UP TO TEMPERATURE AS QUICKLY AS POSSIBLE? The cooler works both ways as a heat exchanger and oil cooler. The oil passing through has been filtered after being picked up from the pan (where it sat HOT after passing through the motor). On a cold start, the oil is not up to operating temperature, so the oil cooler acts as the heat exchanger to bring that oil up to operating temperature without allowing it to overheat. If you bypass the cooler and pull oil straight from the filter or the pan, the oil has not been cooled to operating temperature and you are throwing hot oil onto the bearing, increasing the bearing temperature and wearing it down faster. Plus, pulling oil from the oil filter (you need to have the adapter and smaller filter) limits the filtering capacity of the engine. Why would you want to limit that? IS THE OIL FROM THE DOF® BEING SPRAYED INTO THE BEARING? WON’T VAPOR SPRAY CAUSE THE AIR OIL SEPARATOR TO WORK HARDER? Oil is not being sprayed into the air. This oil is a direct flow, not “spraying.” The distance between the DOF and the intermediate shaft is 1.48mm. It doesn’t get sprayed into the engine, it goes directly into the IMS bearing and flows to the side of the shaft and down into the pan. HOW MUCH TIME IS NEEDED TO INSTALL THE DIRECT OIL FEED (DOF)® ON MY CAR? All of our Direct Oil Feed (DOF)® installers follow a similar labor time structure. If you have any questions regarding the installation time a shop may request please don’t hesitate to contact us. WHAT OTHER ITEMS SHOULD I ADDRESS ON MY CAR WHILE INSTALLING THE DOF® ON MY CAR? Typically on a DOF® installation, the rear main seal (RMS) should be replaced due to ease of access. On manual transmission vehicles, the clutch must be removed so that is the time to determine if a clutch is necessary or not. If the clutch seems good, simply replace the throw-out (release) bearing to be preventative. If you need to replace the clutch on your Porsche, the DOF® installation already includes the labor for clutch replacement, it will only add the cost of the clutch kit itself. On 996 models the air oil separator is also much easier to access when the transmission has been removed. WHAT ARE THE ADVANTAGES OF USING THE DIRECT OIL FEED KIT (DOF)® COMPARED TO OTHER AVAILABLE IMS BEARING UPDATES? The DOF® kit uses oil that has already been cooled by the original Porsche oil cooler and temperatures are reduced even further with our optional in-line filter/cooler. Therefore, the DOF will reduce bearing temperatures while increasing reliability. Most competing products use oil before the oil cooler that results in increased temperatures of their solid bearing. The bottom line is that the DOF’s cooler temperature is significantly better than the competition’s hotter operating temperatures. Additionally the DOF does not affect oil filter capacity. Therefore, you change your oil as regularly scheduled. Some of the other products that try to compete with us may require more frequent oil filter replacements. Perhaps the biggest advantage of the DOF® kit is if a kinked line, clogged port or cooler/filter (optional) were to occur and cause restricted oil flow, then the IMS bearing will go back running as it was originally designed with the added protection of a removed seal for extra lubrication until the issue is resolved. Competing products do not have this advantage because their product uses a solid bearing that requires constant lubrication. Therefore, if oil flow is restricted to their solid bearing then you risk engine seizure resulting potentially catastrophic problems. Moreover, all IMS bearing options on the market are made to help prevent possible failures. Mileage is hard to tell when one may fail. Splash oil is there some times, depending where the g-force is taking the oil. For example, accelerating in a 986/987 Boxster or Cayman will cause the oil to splash to the back and onto the IMS bearing. While the oil will be on the other side of the engine if you have a 996/997 Carrera. If you are cornering, oil will be on one side not where the bearing is. Here, with the DOF, oil is always being directed to the IMS bearing to help extend the life, no matter what position the car may be in. Please do not hesitate to contact us directly with any of your remaining questions at (954) 345-7877. 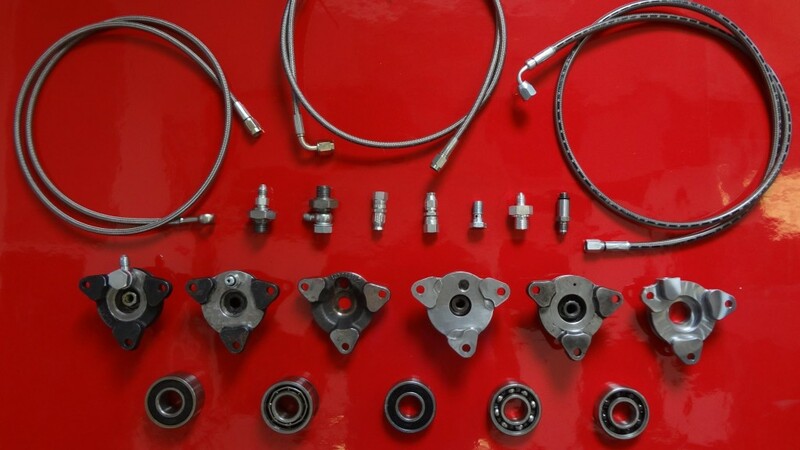 While we provide step by step instructions for installing your Direct Oil Feed® on your Porsche we suggest you consider whether you are equipped with the appropriate tools, time and mechanical inclination before taking on this project yourself. Some of our clients have performed this service themselves and we have complete faith in our customers. We encourage you to carefully review our installation guide first. If you are not sure about whether you can handle this yourself then we highly recommend you contact us at 954-345-7877 to make an appointment. If you are not anywhere near our facility in Coral Springs Florida and can not transport your car to us then we highly recommend you visit our list of reputable independent TRS installers and distributors.